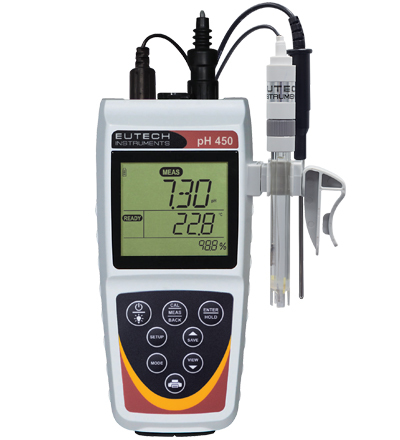 The new Thermo Scientific Eutech 150 & 450 Waterproof Handheld Meters are for electrochemistry measurement. The series includes seven waterproof handheld meters designed to deliver benchtop functionality with the versatility of a portable instrument. Features such as an optional power supply, convenient benchtop stand, and a lightweight but rugged housing allow for high performance in the lab or in the field. The Eutech 150 and 450 meter series allow users to move to wherever readings are needed, regardless of whether they are under a hood, on the production floor, in the next room, at the bench or in the field. The meters incorporate the new Thermo Scientific Grip-Clip electrode holder, an innovative device for securing one or more sensors during measurement, or directly to the meter when not in use. The Grip-Clip electrode holder allows for single-handed measurement and secures to most beakers and sample containers without the need for a cumbersome and immobile electrode stand. * Designed for use with the Glip-Clip electrode holder to enhance portability (models with 12mm or 16mm sensors include Grip-Clip electrode holder as a standard accessory).